I am planning to build a big printer and the cabling from the hotend to the control board will be 5 meters long, at least. What is a good solution to get reliable temperatures readings ? is it still possible to use a semitec sensors? You should be OK with a PT100 sensor over that distance if you use suitable wire. So i have to buy the pt100 dauthger board. can i use a standard 4 wire pt100 of 2m then solder my wires or they need to be the exact distance without any joints ? E3D pt100 are 2 wires only, is that enough for stable reading on long distance ? https://miscsolutions.wordpress.com/2016/06/25/more-delta-printer-upgrades-wifi-and-silence/ includes a section on converting a 2-wire PT100 to 4-wires close to it. great! you mean this ? should be, in my case, twisted pairs or shielded ? what AWG will be ok ? it will be great to have one for testing purpose, how long the leads can be ? 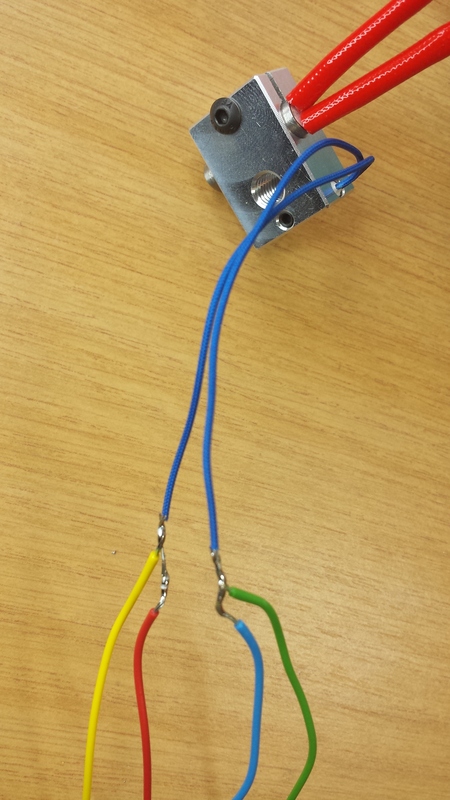 We currently have 2m leads, I will solder on some 5m ones and see what effect that has if any on the resistance. However there is the compensation by using an R value in the config which can probably offset any change in resistance over long wires. Can you contact me via our site (see my sig). I have one spare sample which if you want you could beta test for me (and keep). Please mark the email in caps FOR ATTENTION SIMON re. PT1000 as Idris is handling all the operational stuff and he needs to forward it to me. Yes I mean that. If the wires will run parallel to any stepper motor wires for a significant distance then the wires should be either shielded or twisted pair. The AWG is not critical if you use a 4-wire connection. You cannot use the R parameter to compensate for wiring resistance at one temperature without introducing additional errors at other temperatures. However, a PT1000 is obviously 10x as tolerant of wiring resistance as a PT100.